ExtendNet 100zx is a Fast Ethernet multi-environment print server for up to six printers. 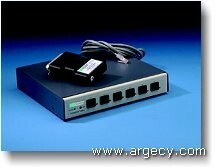 ExtendNet 100zx simultaneously supports Novell NetWare, NDS & NDPS, TCP/IP, Windows NT, Windows 95/98 and Banyan VINES. By offering both 10Base-T and 100Base-T connections and incorporating auto-sensing capability, ExtendNet 100zx provides flexibility for environments that plan to migrate or have partially migrated to Fast Ethernet. For IT managers who want a centrally located print server solution, the ExtendNet 100zx wiring closet design provides the ultimate in security and makes print server deployment and management simpler and more efficient. Plus, ExtendNet 100zx comes complete with a rack mountable enclosure allowing for easy installation and flexibility in the wiring closet.